Circulating pyridoxal-5′-phosphate (PLP) has been linked to lung cancer risk. The PAr index, defined as the ratio 4-pyridoxic acid/(pyridoxal + PLP), reflects increased vitamin B6 catabolism during inflammation. PAr has been defined as a marker of lung cancer risk in a prospective cohort study, but analysis of a larger numbers of cases are needed to deepen the significance of this study. 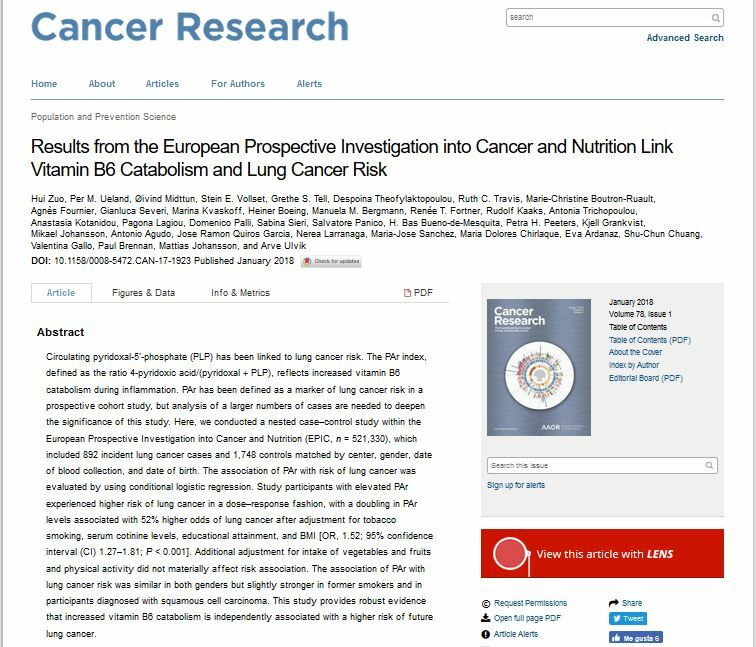 Here, we conducted a nested case–control study within the European Prospective Investigation into Cancer and Nutrition (EPIC, n = 521,330), which included 892 incident lung cancer cases and 1,748 controls matched by center, gender, date of blood collection, and date of birth. The association of PAr with risk of lung cancer was evaluated by using conditional logistic regression. Study participants with elevated PAr experienced higher risk of lung cancer in a dose–response fashion, with a doubling in PAr levels associated with 52% higher odds of lung cancer after adjustment for tobacco smoking, serum cotinine levels, educational attainment, and BMI [OR, 1.52; 95% confidence interval (CI) 1.27–1.81; P < 0.001]. Additional adjustment for intake of vegetables and fruits and physical activity did not materially affect risk association. The association of PAr with lung cancer risk was similar in both genders but slightly stronger in former smokers and in participants diagnosed with squamous cell carcinoma. This study provides robust evidence that increased vitamin B6 catabolism is independently associated with a higher risk of future lung cancer.